OOHHH. . . I'll try it, because citri-strip didn't really work very well at all. . . .
And thanks so much for the encouragement in this! As I said before, it means alot to me when those who wrestle with the real thing think that it looks convincing. In these examples the twist are, as you might expect, very even in thickness. Now on my false version, there is a convergence of these twist across the weld, however the width of the twist is changing. So the hypothetical swordsmith that "produced" this blade would have to have two bars with differing twist width and still be able to match them up. So for those in the know, this would suggest it is only a surface phenomena and not real pattern welding. I must admit that at the time I was laying down the original pattern, the "theme" of the "fire worm" really dominated my thought more than hypothetical swordsmiths. So, as you mentioned, I wanted to give the effect of a worm or snake winding its way down the center of the fuller. This would be the "body" of the worm with the eye and mouth further down the blade. Actually it was more than this... (And now the artist comes out) It was not just a worm, but a battle-line. The four extensions of the "stars" were the arms and legs of the warriors on either side of the wormy battle-line. The arms were extended out toward the center of the fuller and the legs braced on the outer edges of the fuller. The "warriors" start out thick and stout near the cross and forte and as the "battle" continues along the blade the stout warriors grow thin and gaunt, eventually breaking in the middle as they enter the mouth of the beast near the CoP. On the reverse side... I kept the same symmetry near the forte but added a slight progression across the weld up the blade where the "worm" turns into what appear to be "eddies" which then become the "eye" of the beast. Again as the eddies form, the human shape breaks apart. Again the seemingly abstract patterns might have forms hidden inside. That little patch is driving me crazy. It is the one spot where I tried to leave the "too organic" elements in... and it really stands out. I have begun trying to find a way to etch just a small part of the blade to correct this part. So far it is not working. I have tried to bead the etchant up over this area and let it cut, but it doesn't cut. I guess there is not enough etchant. Not sure what the situation is. Maybe the etchant cools down too quickly with such a small area. Also it the surface tension breaks where it is beaded up on the blade, then I get etchant spilling over the blade and have to wipe it off quickly or it messes up the parts already etched. I'm thinking I might make a small scotch tape reservoir around it to get more etchant and maybe put a heating blanket under the blade to get the blade warm... I'll let you know what happens. Thanks again to Nils for the extra large image of the Arhus Farm find. It has allowed me to get a closer look at this portion to know what to do. ...I must ask how long it all took , as it looks like an awfull lot of work and I think that patternwelding could actually be easier . I did not keep up with how much time it takes. It is something that I worked on, off and on, for several years. And with the inking it was just something I did when I had a few moments at a time. I can say this, when I say it is "easy" I do not mean that it is "quick." There is no way that it would ever be profitable. unless you don't mind making about a dime an hour. It is a hobby. But if you like to draw and doodle then it can be a relaxing activity. And as I have mentioned, the fact that you have control over the shapes, you can work on themes. It would be interesting if these "themes" could be duplicated with real pattern welding, especially the "Viking Ship" theme I am contemplating. Since I am still experimenting with this blade I might go over it again. If I do, I will keep a record of the time it takes to give you a better answer. Then we can compare if it would take longer to ink and etch a blade or to actually build it for real. It really is a matter of finances. 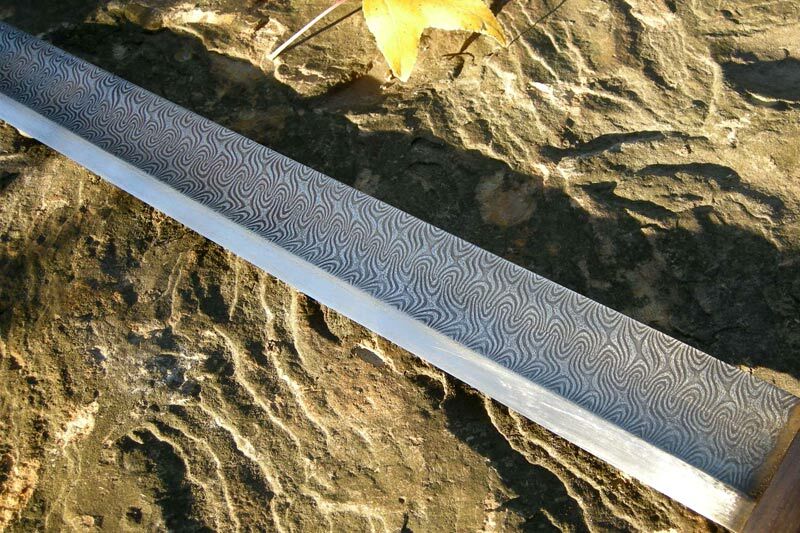 I wanted to find a way to put a convincing surface phenomena on a strong monosteel blade in a way that would be relatively cheap in money (if not necessarily in time). On the handling... I thought my modifications may have changed it, but when I measured and weighed every thing was much the same. I think it is about 2 ounces lighter but that is it. But you're right... it does handle very well. I've used Citristrip on Windless and had good results... I've only reworked one Del Tin blade and I did so much grinding on it there was not need to strip it. Lovely finish. when the finish on the hilt gets a little worn, it will only look better ..and it's already fantastic! I will file this away to try when I get time. But the Gilling West still needs finishing first!